I finally had a session at Flag that would begin to count as winter bouldering. After some recent light snows, the weather has cooled down considerably and shaded north-facing formations are still holding the white stuff. On Sunday, I stayed out almost until dark in 40 degree temperatures trying a silly contrivance on Red Wall. A couple of things are needed. One might be some good sized handwarmers, another would be a light on a tripod, like the Gorilla Light, to make the most of the little time I have. Anyway I am refining my winter kit and will let you know what the final ensemble looks like. On the bouldering book front I am excited to have some prominent people in the bouldering community helping me out at this point (names to be named later) and hope for more contributions as the word gets out. Sending out emails for this help is like sending messages in a bottle, one hopes for the best. Thanks to all who have generously helped so far. And if an email from me is languishing in your inbox, please consider responding. 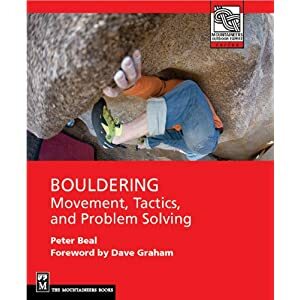 You will be making it the best how-to book on bouldering published. On the climbing news front, the most exciting (and ongoing) event is surely Tommy Caldwell and Kevin Jorgeson on the Dawn Wall, freeing a humongously difficult sequence of pitches in what will be certainly the hardest big wall freeclimb on the planet. Kevin is posting updates on his Twitter feed at this point. If this climb goes on this trip, there will be likely contenders for hardest sport climb (Sharma on Jumbo Love at Mount Clark), hardest big wall free climb, and dare I say it, hardest boulder problem with Daniel Woods on The Game right here in Boulder Canyon, all in the US, not in Europe. I should add also hardest trad pitch with Beth Rodden on Meltdown. Speculation but a potentially very interesting state of affairs in my view. I guess due to the climber, Sindre Sæter and his dad (really modest guys) the ascent didnt get much publicity. That ascent was mentioned a bit in the media but definitely under-reported, in part due to the location and lower difficulty, number-wise. However it appears to be a very serious undertaking!